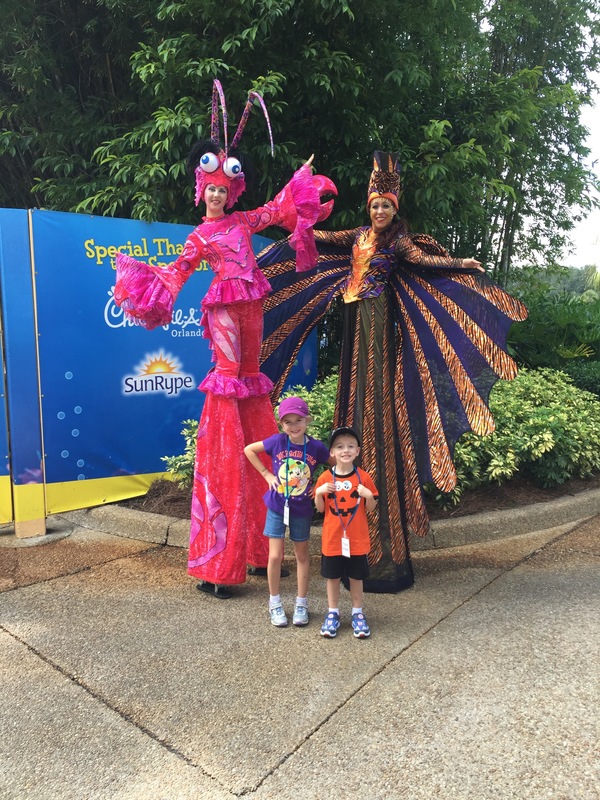 If you want to have a fun filled day with your family, full of Halloween excitement, I highly recommend going to SeaWorld’s Halloween Spooktacular event! This event is fun for all ages, but especially for the kiddos. 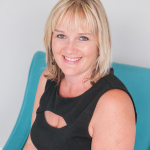 There is so much to do and so much to see! I got to attend the Media opening day event on October 3rd with my husband and two children. My children were super excited about trick or treating and seeing all of the Halloween decorations that SeaWorld has. Children and adults alike will be immersed in an underwater “fantasea” filled with trick-or-treating, dancing sea creatures and pumpkin fish, where kids can also create sea-themed arts and crafts. 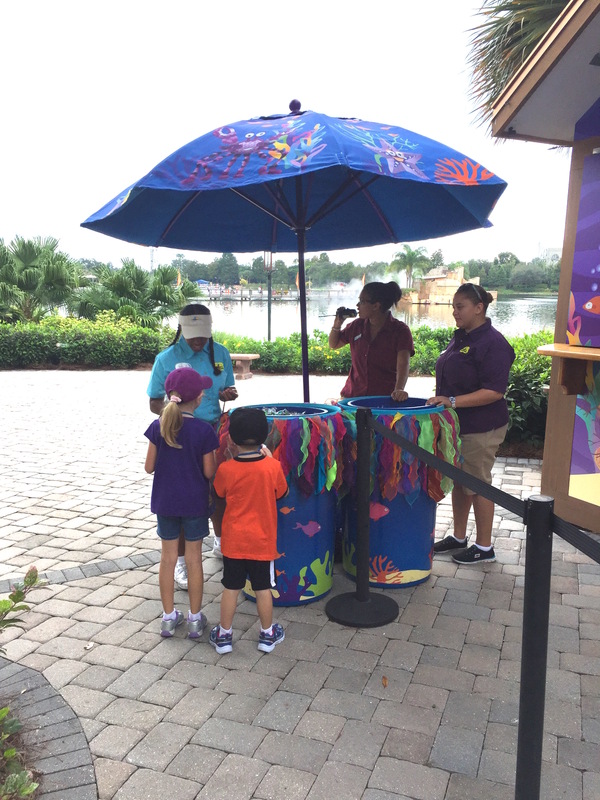 Trick or Treat – Kids can follow the special Halloween Spooktacular pathways through many different stations filled with a wide array of sweets and treats as fun loving sea creatures greet and mingle with guests. Hop aboard the Seven Seas Railway with Otto the Octopus and enjoy a whimsical train ride through Shamu’s Happy Harbor®. Brunch – Enjoy a delicious menu of seasonal and sustainable items while sitting at a poolside table that brings you closer than ever to our majestic whales. Sesame Street’s Countdown to Halloween – Join Count von Count, Elmo, and everyone’s favorite friends from Sesame Street for the kookiest, funniest Halloween hullaballoo ever! This event is set up in the back of the park at the Ports of Call entrance. The event starts at 12pm, so if you want to get to the park early to enjoy some rides and see the Shamu show before trick or treating, that is a great plan! The event also closes at 7pm and runs weekends in October (3-4, 10-11, 17-18, 24-25, and 31) and is included with park admission. Costumes are not required but I do recommend wearing one!! Seeing all of the different costumes was so much fun. I loved the different trick or treating candy stations. The signs are actually labeled with what kind of candy that specific station is giving out, which I think is a fabulous idea. So if your child doesn’t like Tootsie Rolls then you don’t have to waste time in that line! The trick or treat trails are filled with colorful and friendly Halloween decorations. If your little one is scared of halloween ghosts and goblins, no worries!! Nothing scary at all. 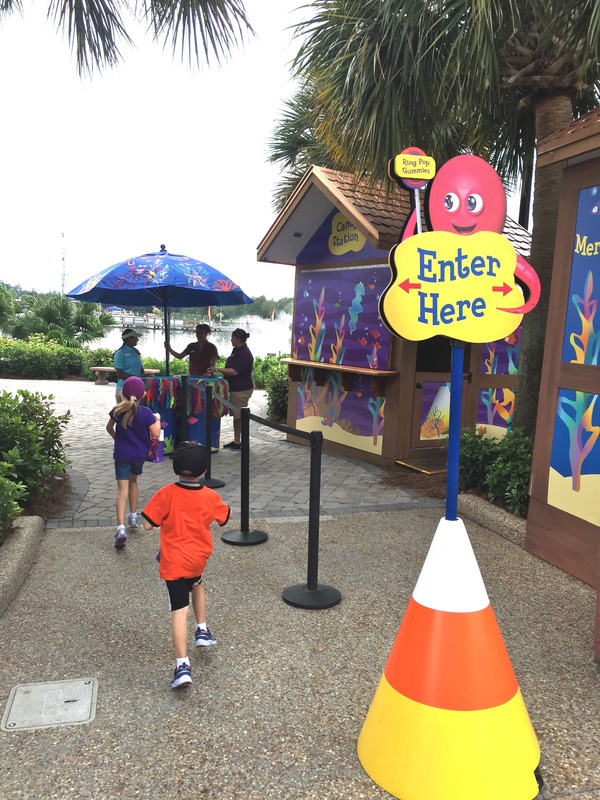 The trail is also filled with bubble blowing stations and I just love the fun music playing. The event has “boardwalk” type games to play for prizes. Some of the cute prizes include a stuffed colorful skeleton and a stuffed bright orange pumpkin. 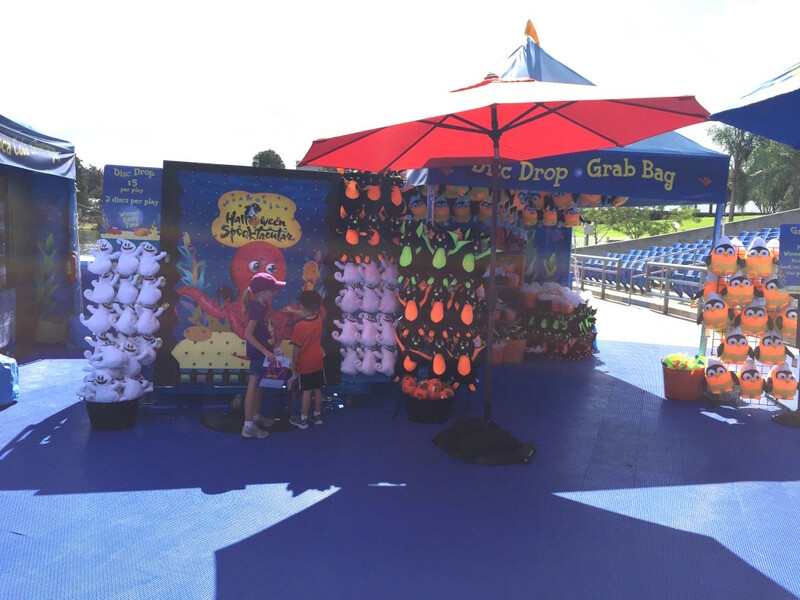 They also have merchandise available, I love the bright orange SeaWorld Spooktacular tshirts! Over near Penelope’s Party Zone there are coloring activities and more fun games to play. If you are hungry there are food stations set up, and also a kids cookie station!! 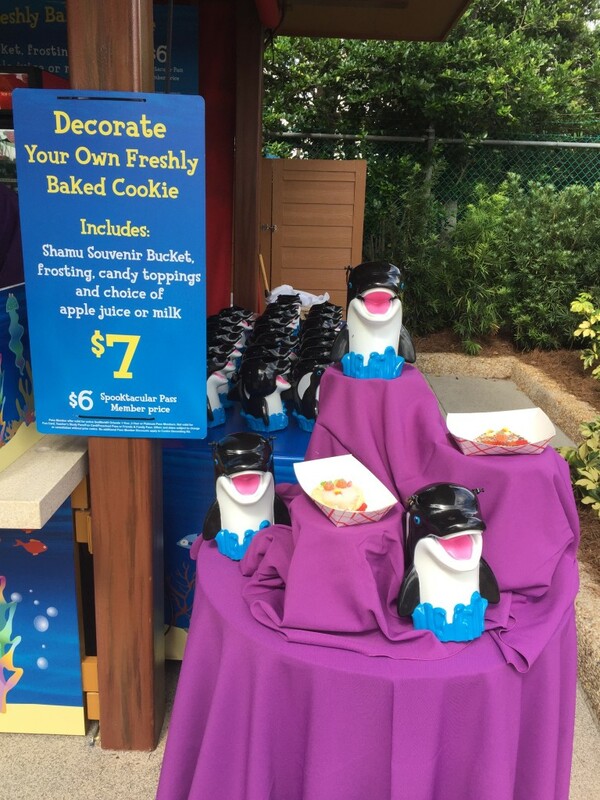 For $7 your child gets an adorable Shamu souvenir bucket, frosting, candy toppings, milk or apple juice and of course a yummy freshly baked cookie. There are tables set up so the kids can decorate it right there, or they can take it to go. This event is a ton of fun, and let me add that I LOVE that the event is included with admission price! 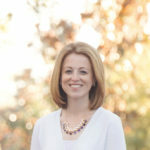 I can’t wait to bring my children back next year! Looks like so much fun! It’s been a long time since I’ve been to Sea World- I know my kids would love it! That looks like such fun! I’ve always wanted to visit the Orlando area during Halloween time, and I will make sure this is on my to-do list when I get down there! That looks like a blast. I always love it when theme parks do holiday events. It must makes the experience that much more memorable. That sounds like so much fun! 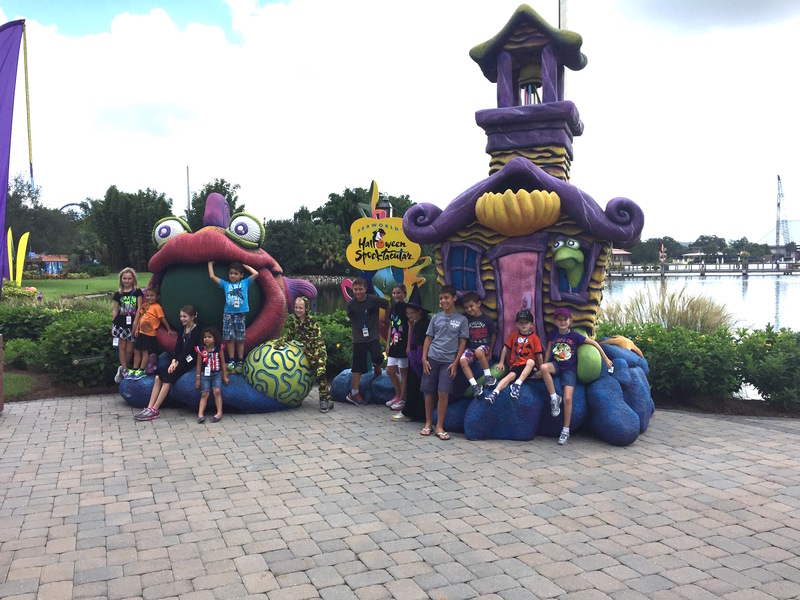 We loved going ot Sea World in Orlando and San Diego! 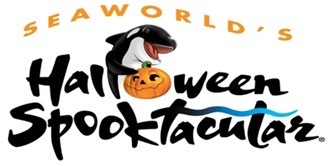 I had no idea SeaWorld did anything like this for Halloween. It’s been so long since I’ve been! They’ve made it a lot of fun for the kids. I love when places have seasonal Halloween events like this! For those who enjoy these places, I think it would be a great time! We don’t have a sea world near us but it looks like fun! I had no idea SeaWorld offers holiday themed events! This looks like something my kids would enjoy and I would have to decorate a cookie of my own too. Wow, this sounds so fun! I love going places like this for Halloween activities. Our zoo had ‘Boo at the Zoo’ which is similar. Wow! This looks like so much fun! I love visiting Sea World with the kids. This sounds like a really fun way to celebrate Halloween. I know my kids would love all of the games. What a great variety of activities provided for families. The candy would be a hit, for sure, but seeing all of the other fun would ensure it’d be a special day. SeaWorld looks like it would be a fun place to go for Halloween. The kids would love it if i surprised them with a trip. This sounds like a fun event. It also sounds like a fun and also safe way to do trick or treating. We went last year and it was a blast for the kids! Sounds like you had a fun media day!